Why are fruit machines so addictive? Why do people sometimes get hooked on placing ‘bets’ when they lose more often than they win? The answer is a phenomenon called ‘The Gambling Effect’, and it’s very relevant to dog training. 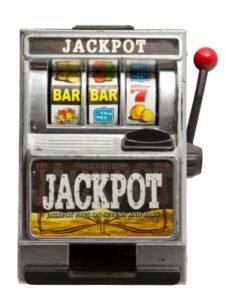 Not only is the gambling effect responsible for a number of human addictions, but it is also a very useful tool for animal trainers. But how does the gambling effect help us train our dogs? And how does it work? How Does the Gambling Effect Help Us Train Our Dogs? If you reward a dog every time he sits, to begin with, these rewards reinforce the ‘sit’ and make his response to the ‘sit’ command stronger. But if you keep rewarding the dog every single time he sits, over time his response to the sit command will weaken. On the other hand, scientists have discovered that if you reward some of your dog’s ‘sits’ and ignore others. And if you do this in an unpredictable and random manner, his response to the ‘sit’ command will grow stronger and remain strong. This is the gambling effect in action in dog training. Where Does the Gambling Effect Come From? Back to a time when we were a primitive species living wild in a dangerous world. In order to prevail against all the obstacles that faced primitive man and wolf, as he struggled to survive, he needed an important character trait. There would be many times when our stone-age ancestors or your dog’s wolf forbears would have to make many attempts in order to achieve a goal. Whether that goal is crossing a river, catching an antelope, or finding water. Only the most persistent would survive. This character trait of persistence exists within us because we find it intermittent reinforcement so rewarding. If we didn’t, we would have given up and died out long ago. Any activity that produces the kind of random and intermittent rewards so often found in nature, will strengthen that behaviour and make it more likely to be repeated. The gambling effect and the persistent behaviour it rewards, is both our friend and our enemy. It encourages unwanted behaviours like betting and internet addiction, but also helps us to overcome adversity. You can make the gambling effect a useful training assistant. In fact, understanding and using the gambling effect to our advantage is a crucial part of becoming the owner of a well trained dog.